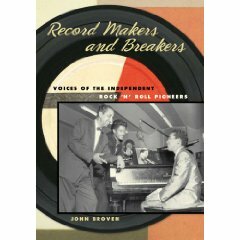 This engaging history of the independent rock ’n’ roll record industry from its raw regional beginnings in the 1940s with R & B and hillbilly music through its decline in the 1960s combines narrative history with extensive oral history material from numerous recording pioneers. This exceptional volume contains the author’s interviews with major players in the independent music scene, including Joe Bihari of Modern Records; Marshall Chess of Chess Records; Jerry Wexler, Ahmet Ertegun, and Miriam Bienstock of Atlantic Records; Sam Phillips of Sun Records; Art Rupe of Specialty Records; and many more. Behind-the-scenes sources include London Records’ remarkable Mimi Trepel; music publishers Gene Goodman and Freddy Bienstock; The Cash Box trade magazine editors Ira Howard, Irv Lichtman, and Marty Ostrow; disc jockey Bill “Hoss” Allen of Radio WLAC, Nashville; recording studio/label owner and erstwhile teenage jukebox operator Cosimo Matassa; and many, many others. If you require a signed copy direct from the author, please contact him for a quote (including postage) here. Note - Purchasers living in Europe will be charged in your local currency at the rate of exchange applicable at the time of purchase.